It all began with an idea…. A couple of months ago I returned from the trip of a lifetime. During the month of June, in the short space of eight days, I left planet earth. Momentarily of course. I visited another planet and returned with my Faroese tales. For me personally, ‘the trip of a lifetime’ means that I am alone, discovering a new place without too many tourists to compete with. 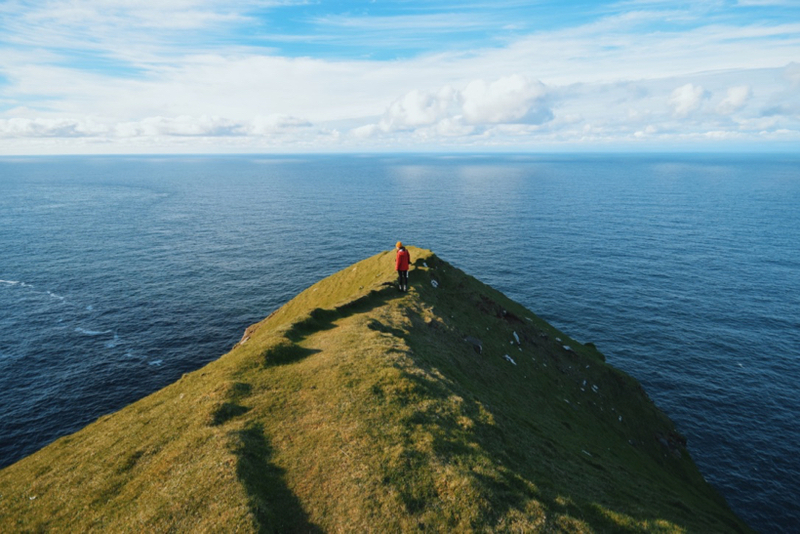 The Faroe Islands taught me that the landscape on planet Earth can be so impressive that I am made to feel small, like we are all insignificant in this world. This is the destination you need to visit if you a) need some good air b) want to escape ‘reality’ for a period of time and c) want to see scenery like never before. It all started with an idea, a crazy one you might say. My cousin was visiting and she wanted to see Scandinavia. As I’m based in Germany, driving to Scandinavia didn’t seem like a difficult feat. 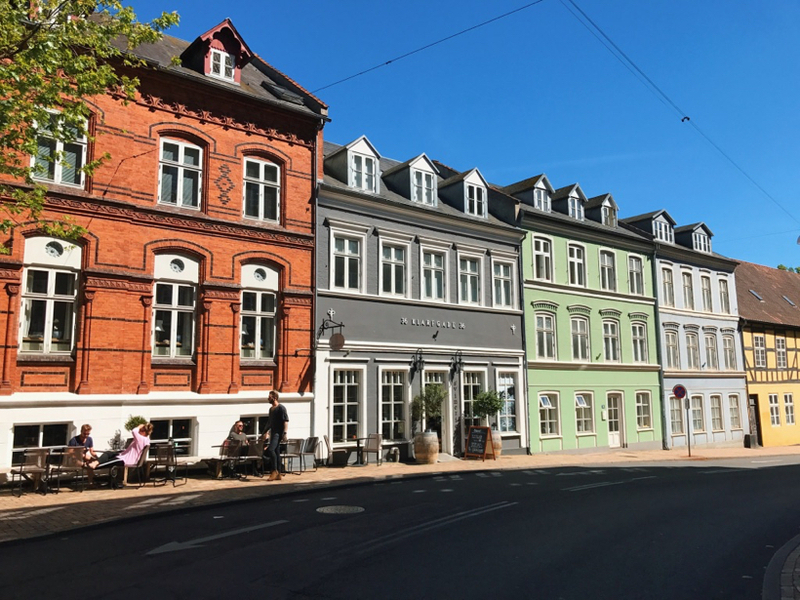 We made plans to head north from Frankfurt and take the German-Danish ferry from Puttgarden to Rodby and zip around Denmark for a week or so. My cousin has Danish neighbours and they were kind to arrange accommodation for us in a couple of different locations. 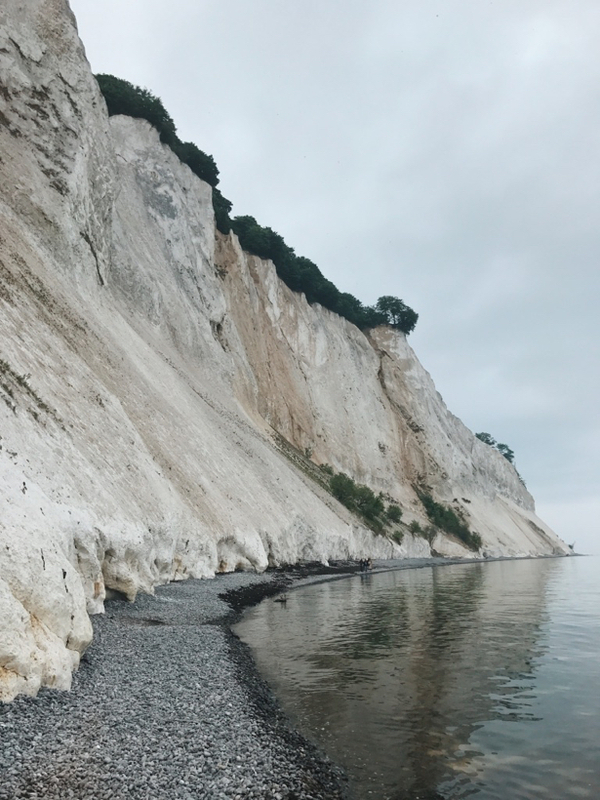 En route to Copenhagen, we decided to stop at Mons Klint – a place which seems so ‘un-Danish’ that it’s worth a look. 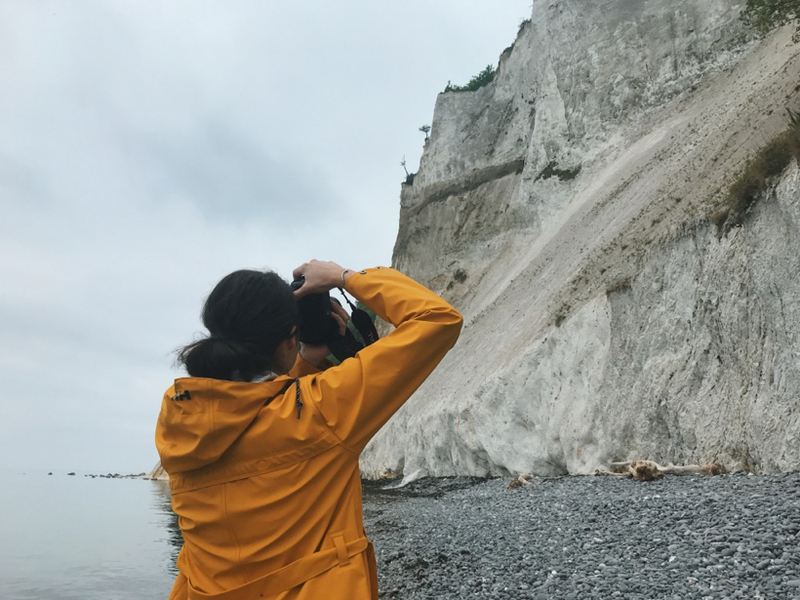 Forget the white cliffs of Dover, or Normandy – Denmark’s lesser known giant chalk cliffs must be seen! After leaving the cliffs, we lost tire pressure in all four of our friends. I’ll put this down to driving on what ‘seemed’ to be a road but was indeed not. During this moment, I was wishing I had listened to Dad more when he tried to teach me how to maintain a car. Feeling a little ridiculous, we drove around Denmark’s most remote farmland, in search of a mechanic. Elated, we spotted one – run by a man so old but so kind. There was a clear language barrier, which was unusual for Denmark. Most of its citizens are more fluent in English than most English native speakers. However, my acting skills prevailed and I swiftly sorted the situation. While imitating the blowing up of a balloon and pointing to the tires, he quickly got the job done. At the end of it, I paid him with a bottle of wine, which I had cheaply smuggled over the border from Germany. 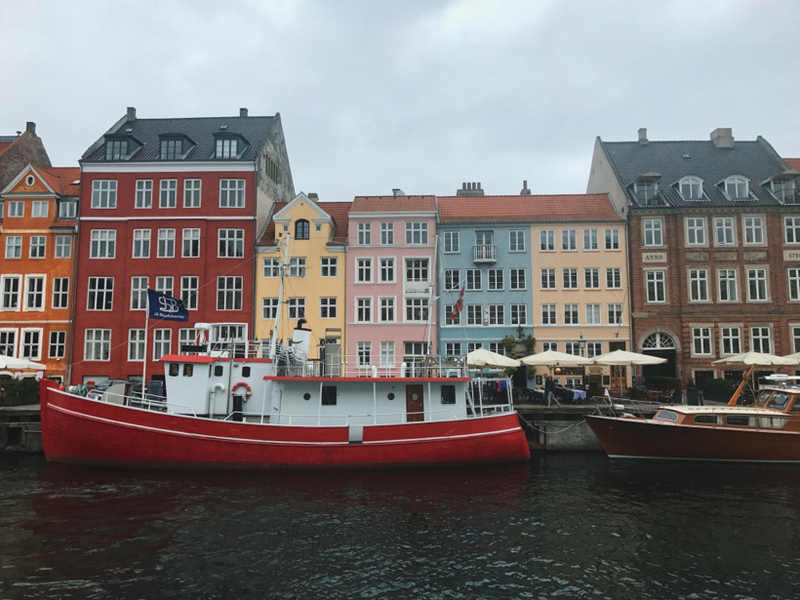 Let’s go from Copenhagen to….. Sweden! Fast forward a few days in Copenhagen, we realised it would be a geographic crime not to step foot onto a train bound for Sweden. “It’s never been cheaper to get to Sweden!” I said to my cousin after paying 30 euros for the ticket. The entire trip was done in under 30 minutes. We spent half of the day in Malmo & the other half in Lund. A separate Swedish blog post will follow, stay tuned. On my 29th birthday, (a very insignificant number), we headed for Aarhus via Odense. Odense was nice enough to stop at for lunch and a coffee but we were on to bigger things. We also realised we had been pronouncing Odense wrong the whole time. It sounds less like an audible word and more like a sound you make when you’re choking on a biscuit. 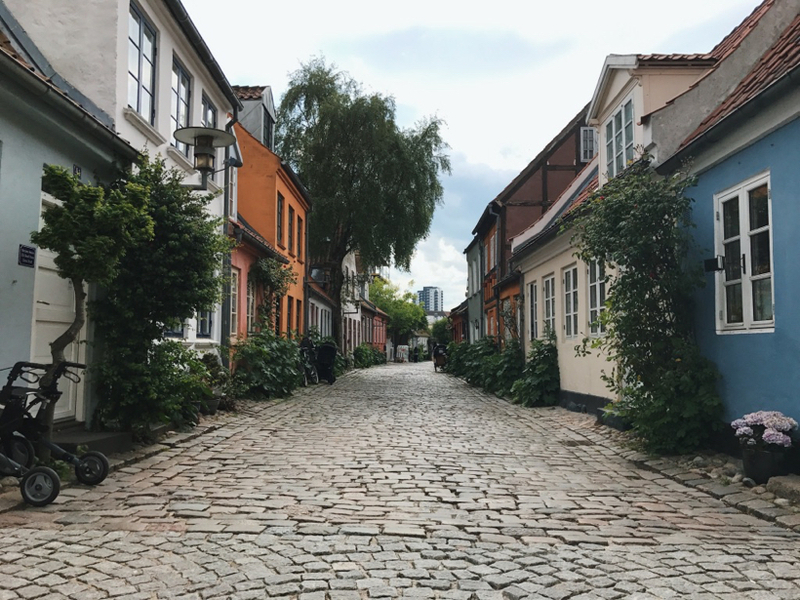 Aarhus was without a doubt my favourite Danish spot. 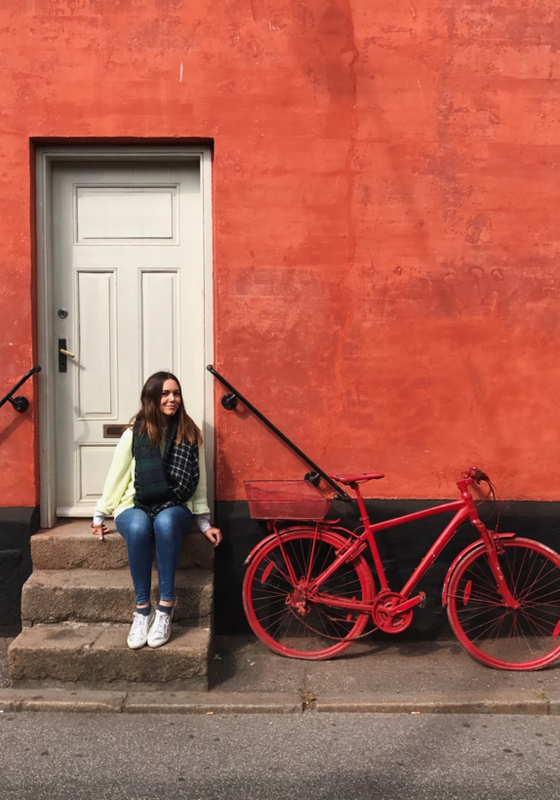 Its tiny little cobblestone streets, endless supply of locals on bikes and rows of colourful houses were a delight to the senses. I’d love to return to Aarhus properly another time. 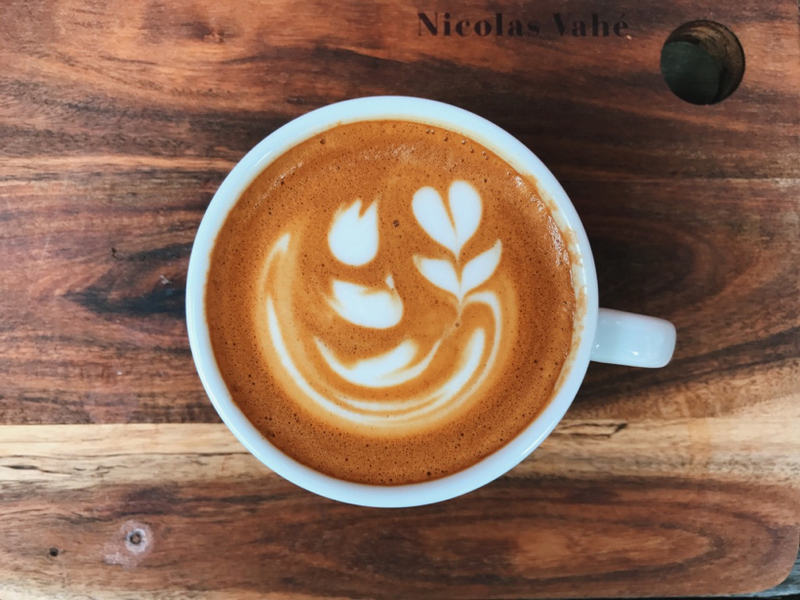 I checked European Coffee Trip for a speciality coffee option and found Great Coffee owned by the Danish barista champion Søren Stiller Markussen. 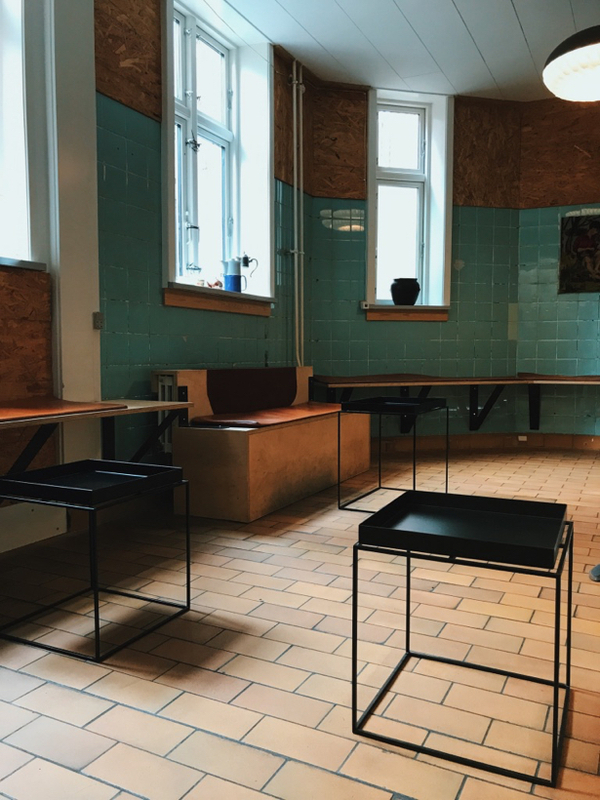 Originally an old bathhouse, this factory style café has been converted into an ultra-hip, speciality coffee institution in Aarhus. Our days in Denmark were numbered – the trip we had been fantasising over was just on the precipice. 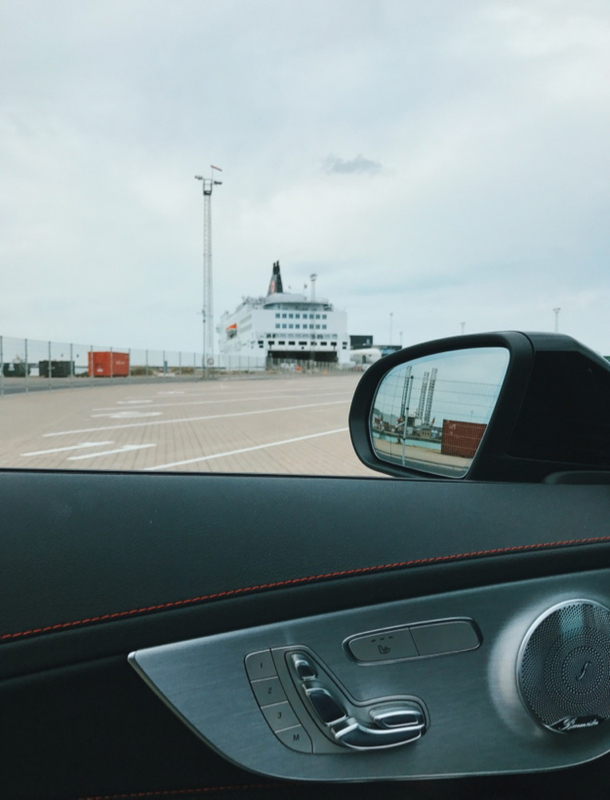 It was time to drive to the most northern part of Denmark’s coast and wait in line at the Hirtshals harbour and board the Smyril Line ferry. Many people had asked me if I was crazy before the trip. 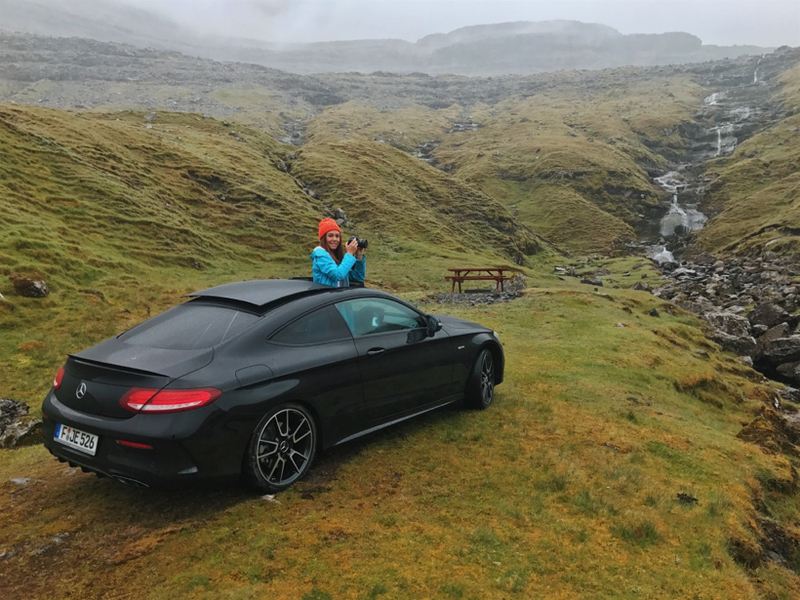 They couldn’t understand why we would drive all the way up to take a 45 hour ferry when we could easily fly to the Faroese island of Vagar and rent a car from the airport. 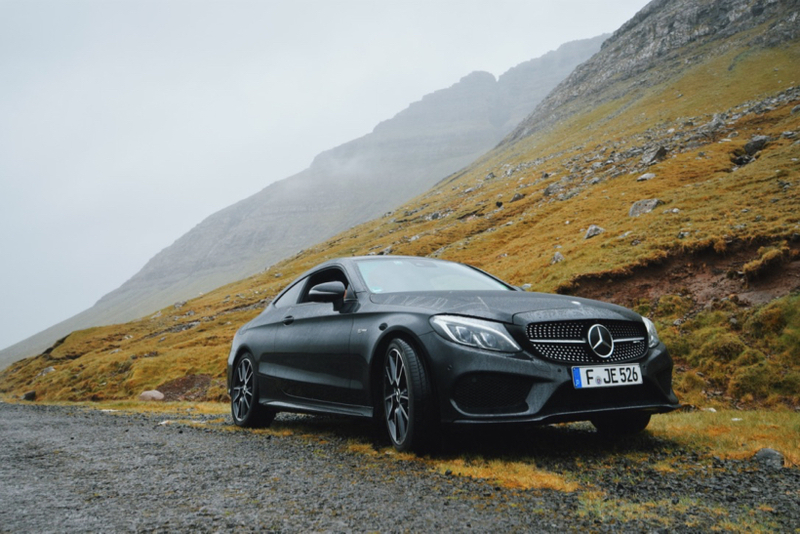 I made this decision for a few reasons – firstly, our car was new, and we wanted to take it for a real spin. Secondly, taking your own car brings something so adventurous. It’s yours which means you don’t have to worry about what happens to it like you do with a rental. So there you have it – our black beast boarded the ferry and we crammed onto the boat. It was at this point that I realised why our cabin ticket had been so cheap. Do not for one second assume that I had booked pure luxury for this trip. Oh no. We were shoved to the very bottom floor of the ship, like poverty stricken third class people on the Titanic. We were even below the cars. There must have been some kind of seafood ‘catch of the day’ being stored down on our level as the entire place stank like fish. Gross. Anyway, the trip wasn’t all that bad. If you’re on a budget and don’t mind sharing, it’ll be okay. In saying that, we upgraded to a pricier room on the way back. Overall it was a two-night stay – the morning of arrival the alarm woke us up at 4AM to get to our car by 5AM. And this is when the magic began. 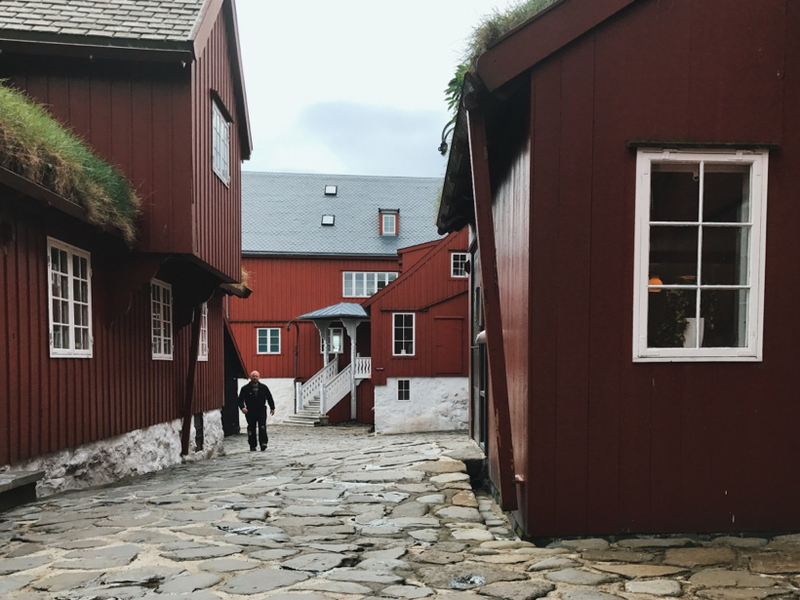 A first look at Torshavn: the smallest capital city in the world. It was everything we could’ve imagined. However, not as small as I had thought. 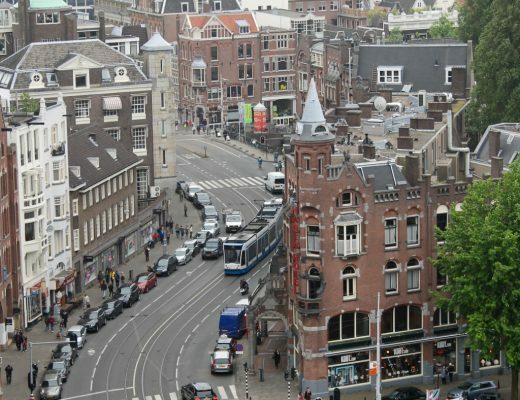 There is no apartment living in this country – everyone has a house and there’s quite a bit of sprawl. 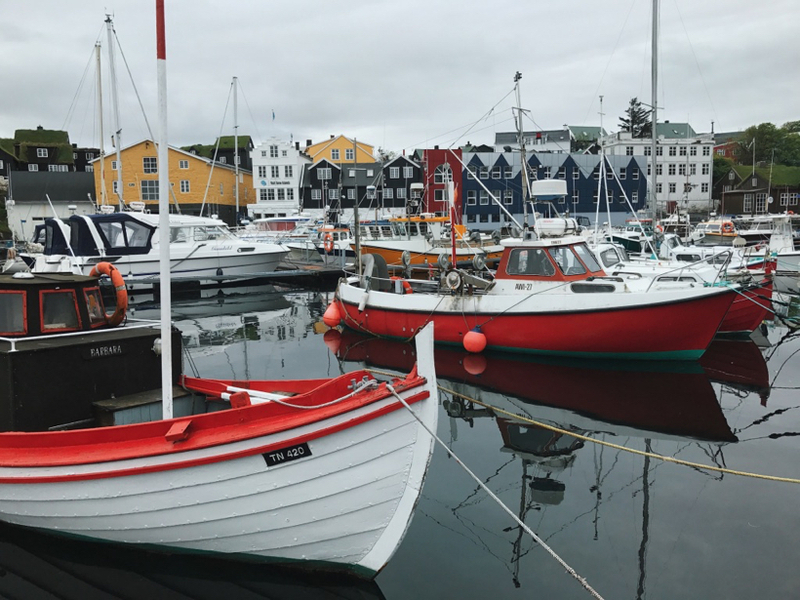 So although the city only has around 12 000 inhabitants, Torshavn felt more like a bayside town. After disembarking the ship, we checked into our Torshavn accommodation and hit the road with the car. It was a classic sense of “let’s go get lost” as eye-rollingly cheesy as that sounds. We followed our loins and well, it was a pretty good first try. After following the first scenic route we could find (a long, barren road for about thirty minutes), we pulled over to stop and take some photos of the landscape. We were already impressed by this point. We pushed forward – only to come across a change in landscape. It went from being slightly mountainous and a rich auburn brown (see above) to being foggy, mystical and dark green (see below). This is the green scenic road number 50, veering left away from Torshavn. We took a swift turn left from the green scenic route number 50 and were met with the most spectacular view at a place called Stidjafjall. 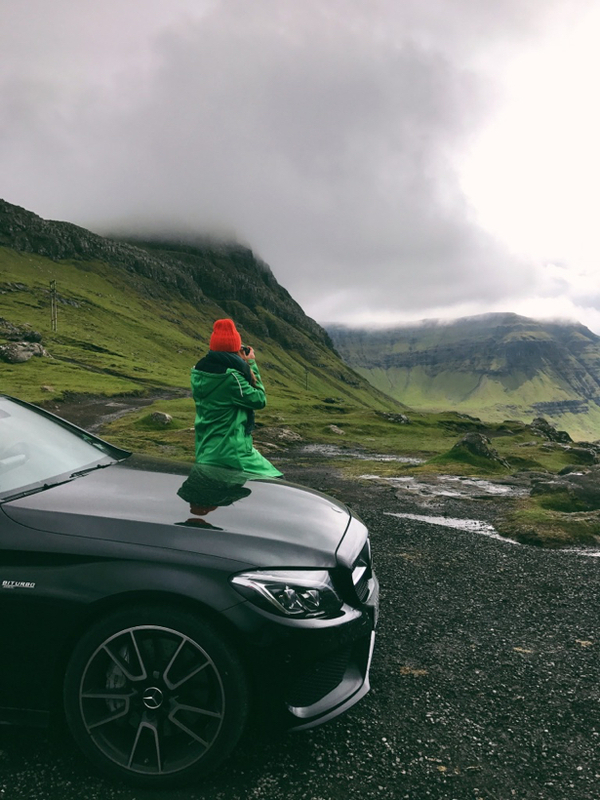 It was here that my cousin took a photo of me and the car (which Mercedes Benz actually reposted on their Instagram page) and we sat there absorbing it all. I won’t bore you with the details of our emotion – but after such a long and arduous journey, it was lovely to be rewarded with this. It was at this very point (above) that we knew the next eight days were going to be unforgettable and full of colour, life and adventure. We weren’t wrong. 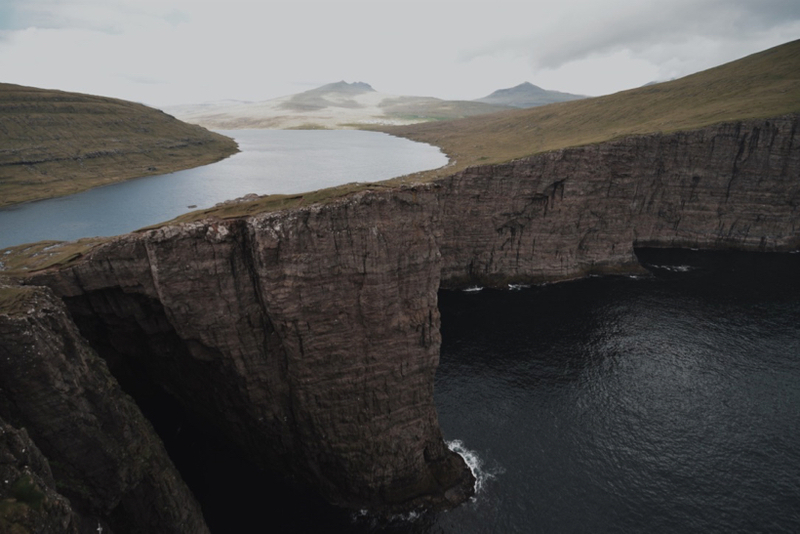 The Faroe Islands is a country made up of 18 islands – most of which are connected by underwater sea tunnels or bridges. Those which aren’t, are connected by ferry and helicopter services. 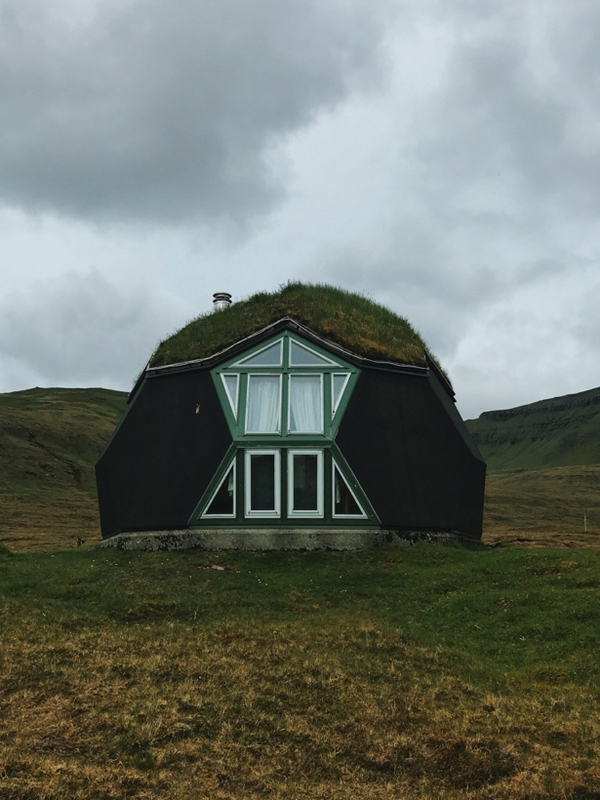 Vestmanna is also home to the funny looking dome houses (see below). Drive to Vestmanna town centre on the number 21 red road and you can’t miss them. 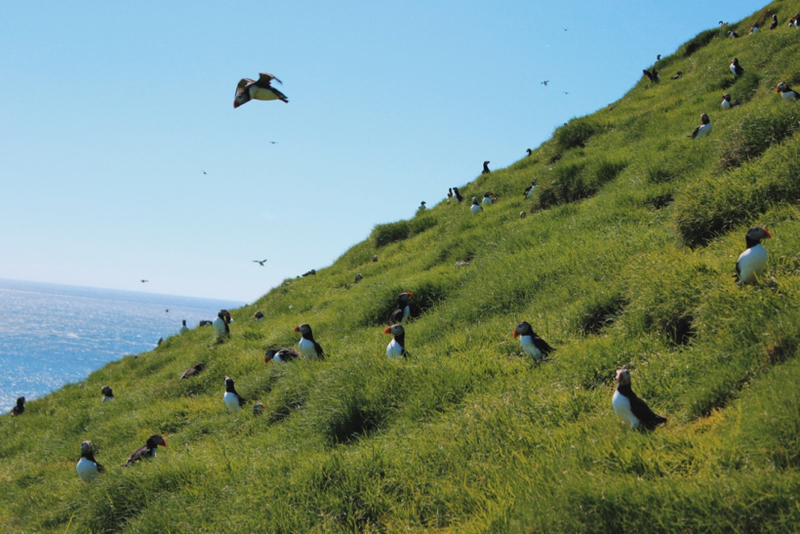 Also, if you’re chasing puffins, we had been told that we might see a couple in Vestmanna. Sadly we didn’t see them but the man at the tourist information told us we could catch them in Gjogv. As we were heading there the next day, we thought that would be our chance. More on the puffins later…. 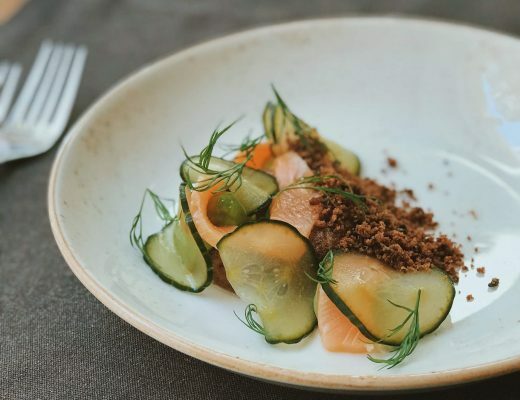 To see as much as we could on the island of Streymoy, we drove to Kirkjubour to meet with head chef Poul Andrias Ziska of the famed Michelin Star restaurant KOKS. Walk into the restaurant and you’ll immediately smell the scent of wood and get a sense of space. At one given time, they will only allow bookings for around 30 people each night. This means it could be a little hard to get in however I suppose that’s the sign of a healthy business. They are usually fully booked so make your reservation early. 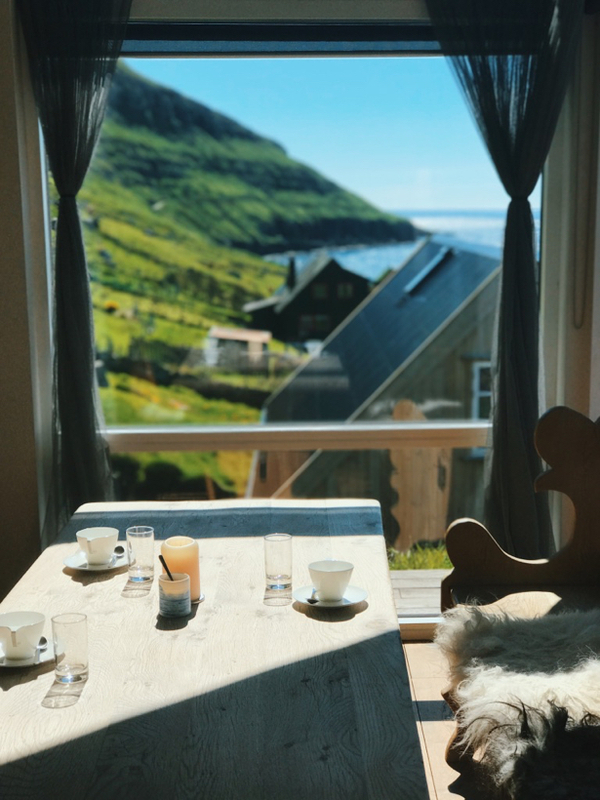 The restaurant is almost entirely made up of windows which overlook Kirkjubour’s bay. 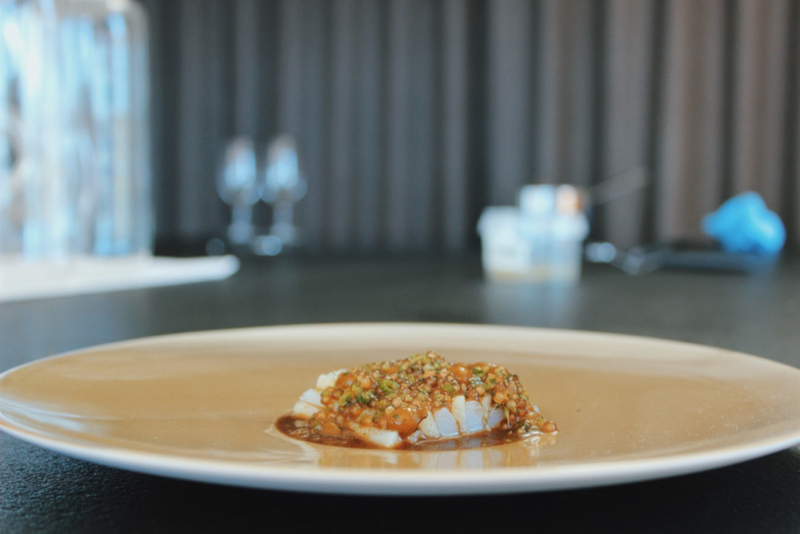 We were lucky to watch Ziska create two signature dishes from his menu specifically for this article. The first was ‘skate (in the stingray family) with potatoes, seaweed powder, bladderwrack seaweed broth and tapioca’. “The starting point of KOKS style is Poul Andrias Ziska’s culinary creations. 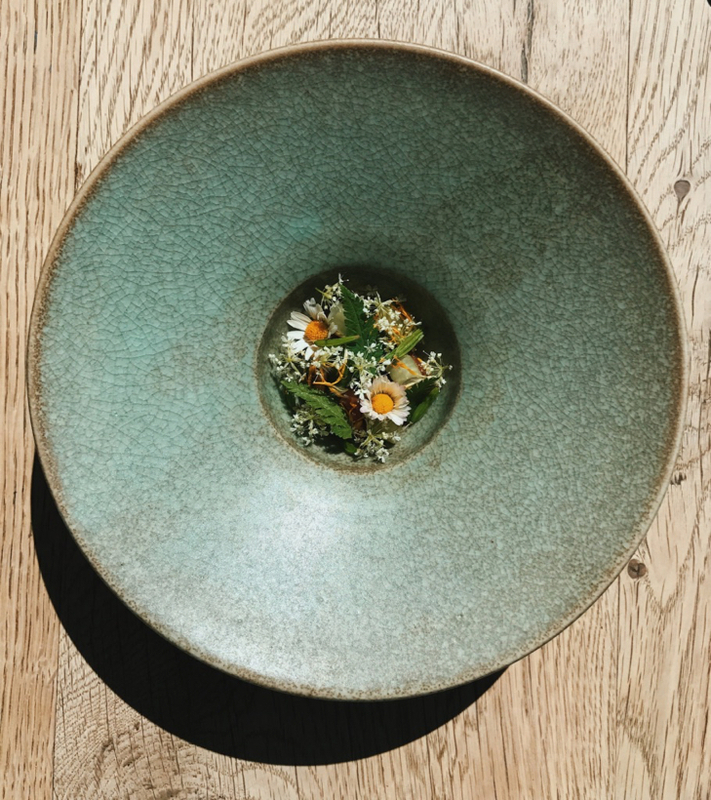 Head chef at KOKS, he has the ability to put Faroese landscape in a pot. 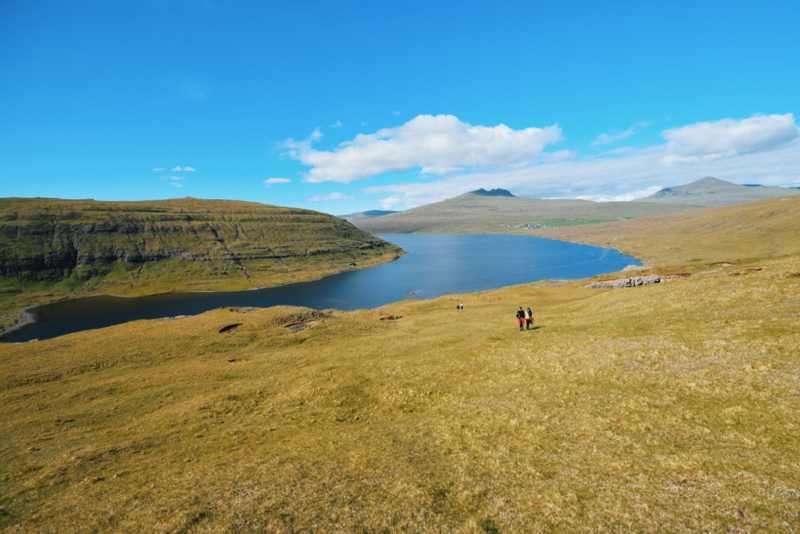 Kirkjubour is a great place to start at if you’ve just arrived in the Faroe Islands. 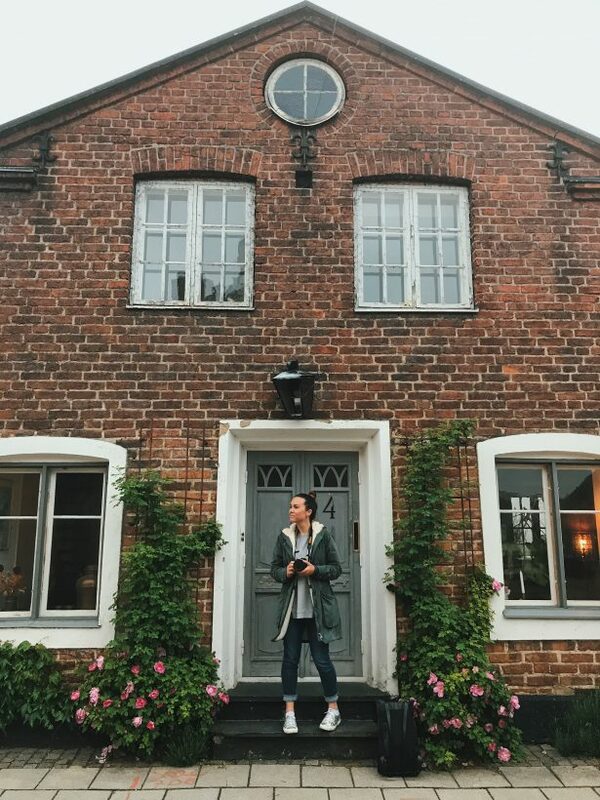 Besides the scenery to take in, the area is steeped in history with the oldest inhabited farmhouse dating back to 1100 and an old 12th century church. I have read online that it’s a nice hike from Torshavn if you’re feeling active. That being said, we drove. We had plenty of hiking opportunities coming up. 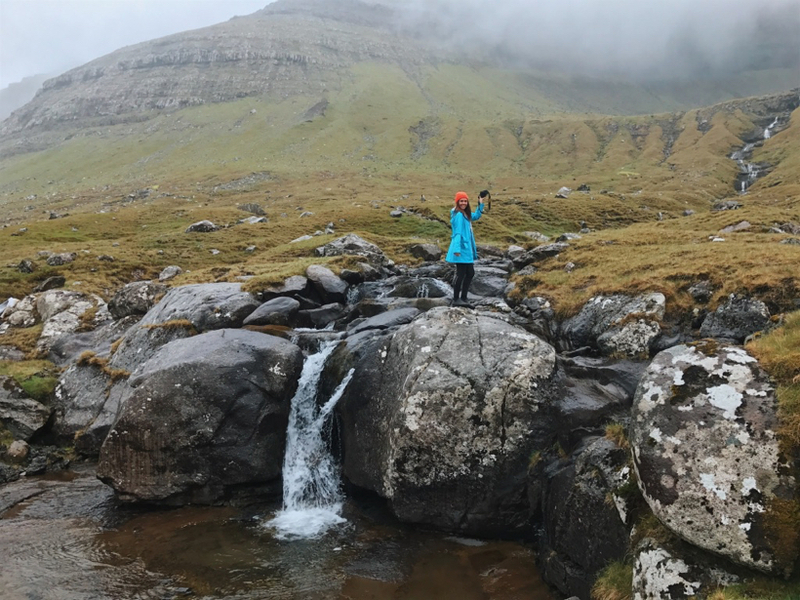 After spending a good three nights on the island of Streymoy, we thought it was best to change the location. 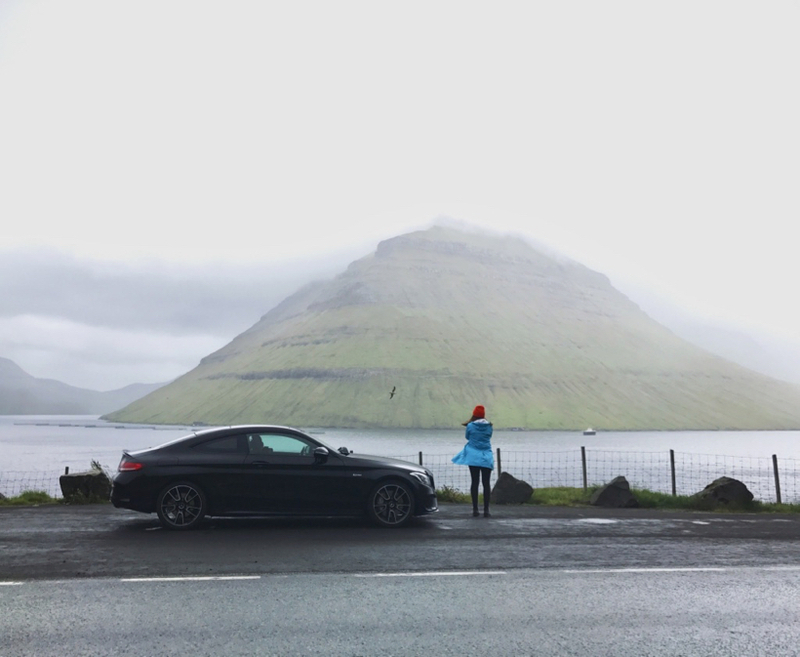 We hopped into our car and headed for a new island: Eysturoy. This turned out to be a great decision. 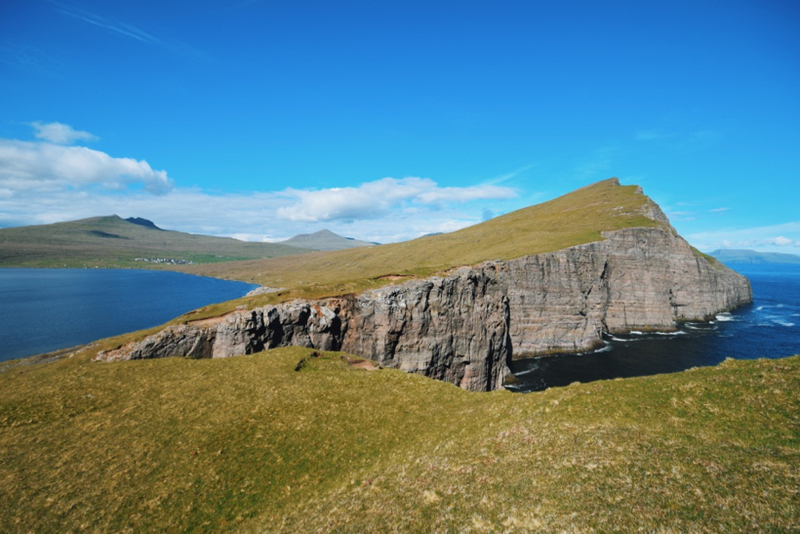 Eysturoy was completely void of well…. people. It was however plentiful in sheep supply. We’d seen sheep on the previous island but the amount here was *never before seen*. 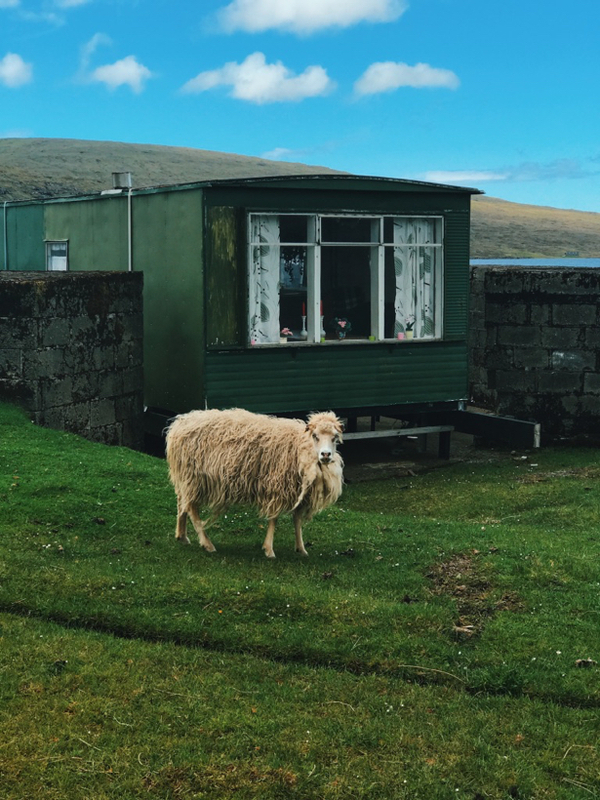 Imagine you’re driving around a rocky, cliffy island, surrounded by newly birthed spring lamb, fleecy sheep, swooping oyster catchers (the national Faroese bird) and to top it off, you’re staying in a picturesque and quaint little village. 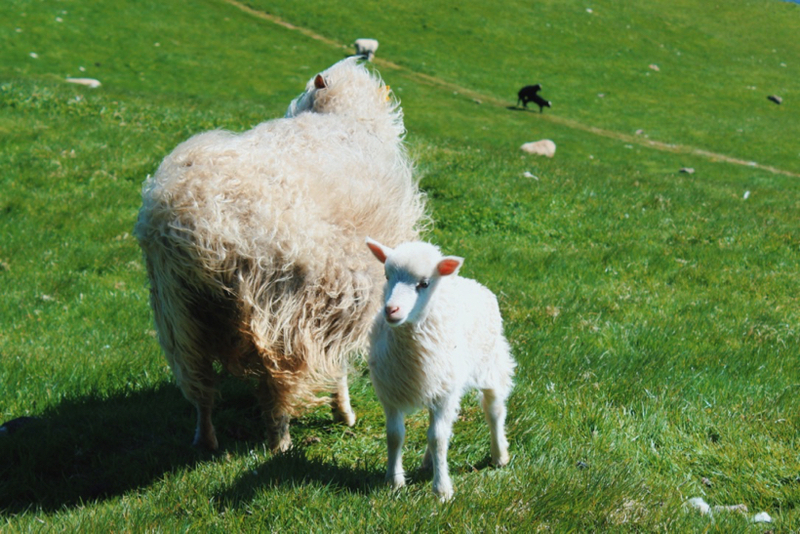 You just can’t trust these sheep – look what they’re up to in the background! Oh my. I had read that Gjogv was a must see but to see this place with my own eyeballs was something else. We paid a few bucks and decided to do the 10KM hike through private property. We knew from previous exercise attempts that we get hangry pretty quickly, so my cousin and I made 6 sandwiches. Yes you read that correctly. I think I stood at the Gjogv gorge for about 25 minutes, hoping to see a flash of orange, hoping that my beloved puffin would appear and show itself to me. To no avail. However while staring out aimlessly towards the ocean, a friendly Japanese woman said hello and in conversation discovered that I was on the hunt to spot a puffin. She told me to simply book a ferry to the island of Mykines and that she had been there the day before. She said it was practically a puffin wonderland. I made a mental note to do it and continued my hike. Goodbye Gjogv, hello airport pickup! There was no time to fluff about – we ordered him straight into his hiking gear and told him we were going to do an easy 45 minute hike. Four and a half hours later, after getting lost several times and being swooped by nesting sea birds, we had made it to the top of a very special place. Definitely one of the most remarkable pieces of landscape I’ve seen in my 29 years. See what I mean? 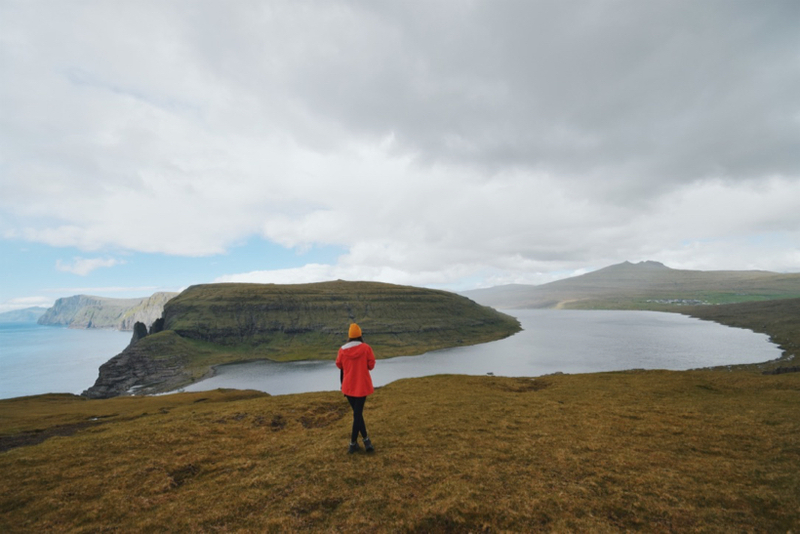 This place is one of the Faroes’ most easily recognisable nature spots. It’s known as the optical illusion. Actually, it was beyond breathtaking in person. As I was dangerously perched here, (sorry Mum) I watched the waves crash hundreds of metres below me, I saw the biggest & fattest seagulls swoop around me, heard the wind blowing in my face and smelt the strongest scent of salty sea air. The level of sass on this sheep is unbelievable. Reaching the lake for this hike should be easy enough, we just had no idea what we were doing. Oh and the country doesn’t really believe in many signs. So you need to know what to look for. Here are my vague instructions: heading from Torshavn, through the underground tunnel to Vagar, just before you hit the airport, you’ll see a big lake. There are some small wooden huts like the one pictured above. If you can see a tiny little unmarked car park nearby these huts & beside the lake, park your car and walk through the small iron gate. Lift the latch to enter. 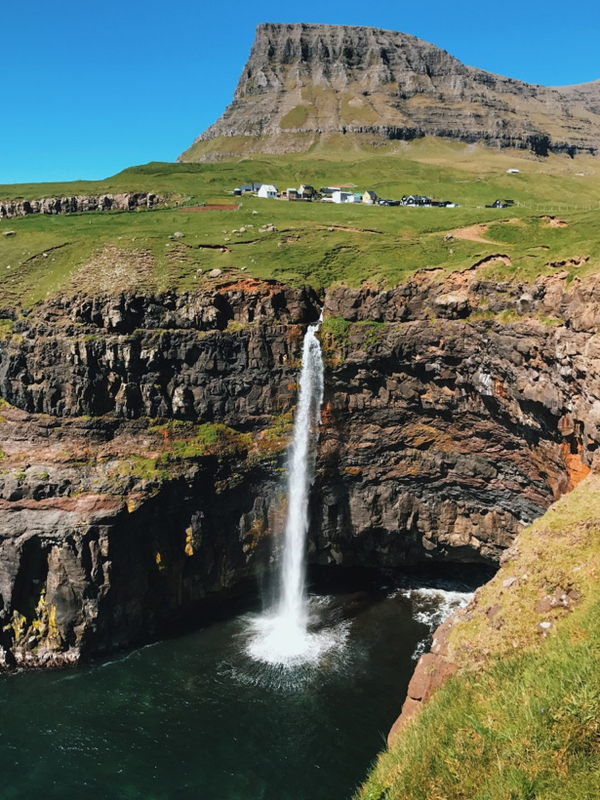 More of Vagar’s Gems: Gasadalur Waterfall…. We’ve all seen this waterfall in all Faroese photos. It’s a pretty powerful waterfall spewing out of the ground. Definitely worth the drive from the airport & the Sorvagsvatn Lake. Head for the town Gasadalur and you should see a few cars parked on the road. A couple of cars parked = tourists / tourist spot. That’s how few people there are in the Faroes. I love birds, especially funny ones and this was some kind of bird paradise. Immediately upon arriving, we heard the prehistoric squawks of all types of birds. I had a good feeling that in my puffin quest, the third time would be a charm. 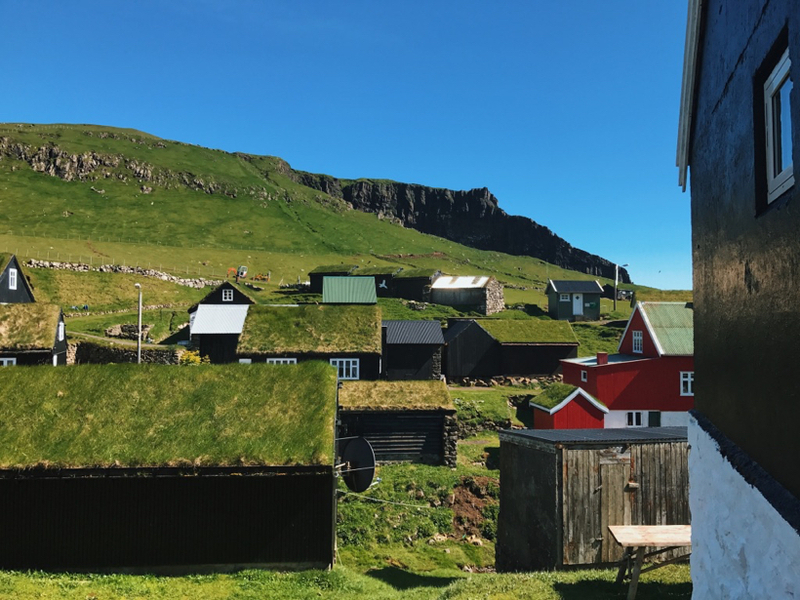 The island of Mykines is a little bit of a local taboo right now. I’ll tell you why. 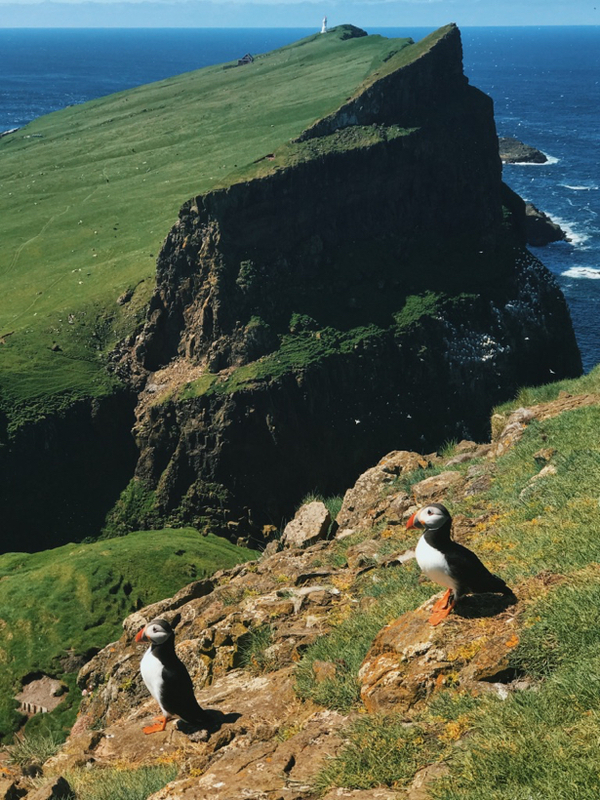 The local business and perhaps even the tourism board have clocked on that puffin spotting is a big potential enterprise. They are in the process of making it impossible for regular tourists to book a ferry, turn up and just roam about as they please. Pretty soon you’ll have to have a certified guide to show you around. And that guide will be very expensive. The tourist office in Torshavn was already beginning to sell helicopter ride + a Mykines guide for a couple of hundred euros per person. We were lucky and were still able to get the ferry by ourselves. As my friend Megan from Megan Starr pointed out, the puffin at the top left side looks like it’s on a mission to save the world! I can’t choose which photo to keep. The puffins are acting so hilariously in both photos. These clownish puffins are just ridiculously funny to observe. 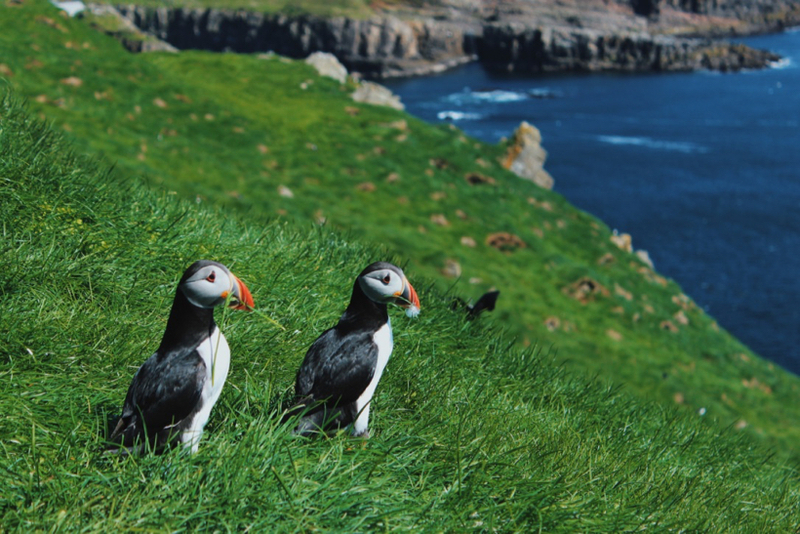 The local authorities say that the new restrictions are to protect the environment and the puffin colony. In direct contrast to that, one day the headline of the newspaper declared that Mykines “shouldn’t become a money making venture.” I guess it’s a polarising issue. I’m all for preserving and protecting the environment of course – although I do have to point out that the 9KM hiking track goes directly through the colony. If there’s any sense that the birds are nervous of you walking through their home, there’s no way to avoid that. 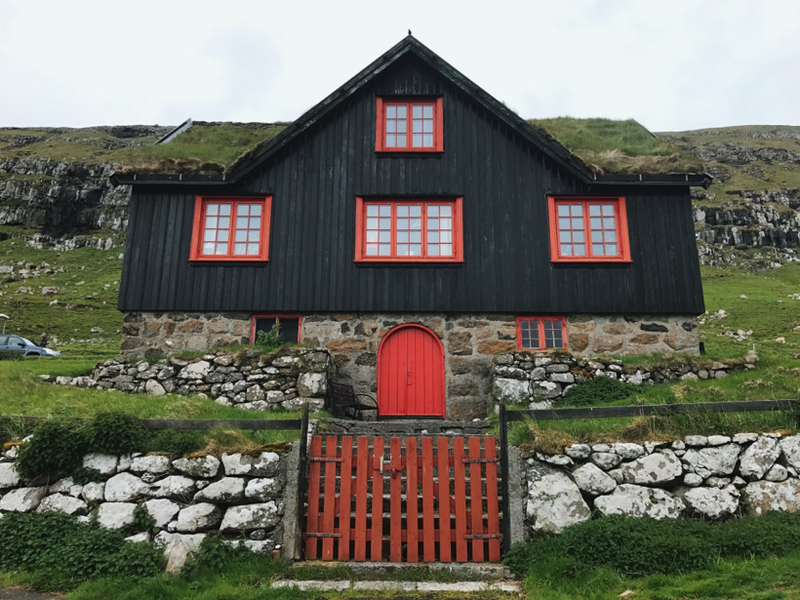 As you know by now, the Faroe Islands is a sparsely populated place. In total I counted roughly 25 restaurants in the entire country. Before you spit out whatever you’re currently eating in shock, yes that’s correct. But do not fear – there’s a system in the country to help the starving and it’s called home hospitality. If you see such a sign, simply knock on their door and you will sit at their table and be served anything on the menu. On the island of Mykines, we were delighted to meet Marit at his B&B. 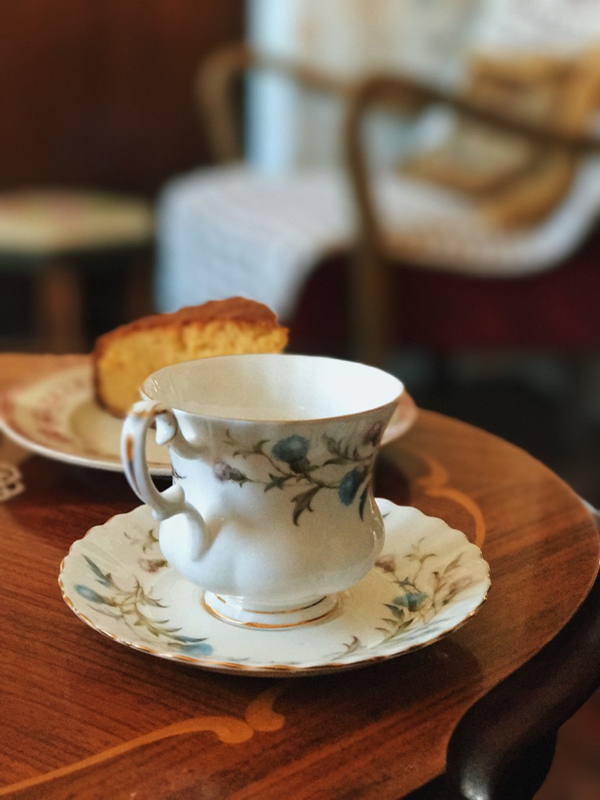 He served us hot tea and freshly made orange cake. It was so delicious and after finishing my piece, I asked him why it was so good. He told me it was full of lard. Wanting to tick another couple of accessible islands off the list, we drove to Kunoy, Bordoy and Vidoy for the day. Admittedly it was raining and the weather was gastly this entire day so it could’ve had a slight impact on our impressions but we didn’t find anything magical in Vidoy. 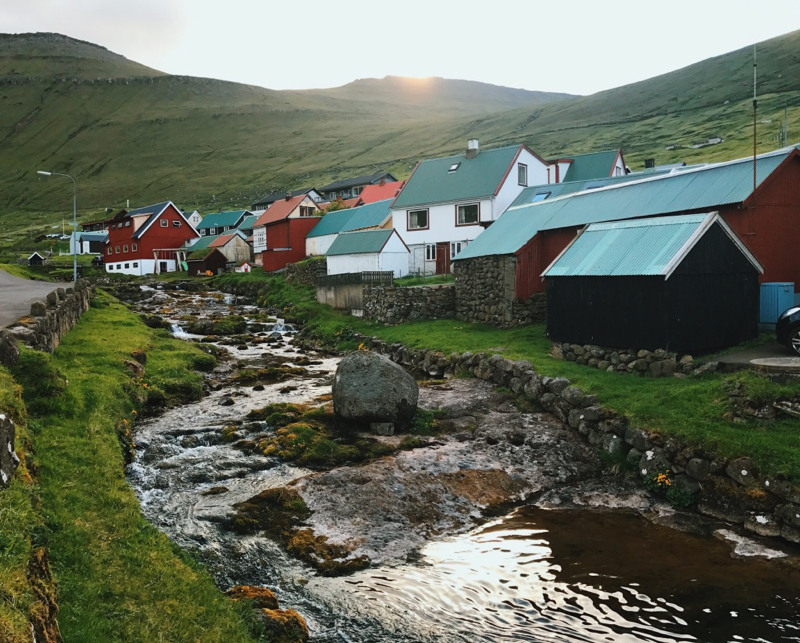 In Bordoy you’ve got the Faroes’ second largest city called Klaksvik. We were bordering starvation and had to stop – luckily we all had a great meal at the only restaurant in town called Frida. Zipping about near Klaksvik on the island of Bordoy. Bordoy was an interesting experience though. Although it was moody and foggy, we decided to take some slow driving videos with music. What we failed to see was a herd of sheep coming down the mountain to tell us to back off. (We were close to their babies.) After being accosted by mama sheep, the three of us were held hostage in our car for a while. This took place right after the photo of me in the car (below). Mountain, bird and wind – check! If you got this far, I’d like to congratulate you! This was indeed a very long post. I’d like to ask you a favour now… you know how long it took you to read this and you can probably imagine how long it took me to take the photos, collect the info and write this blog. 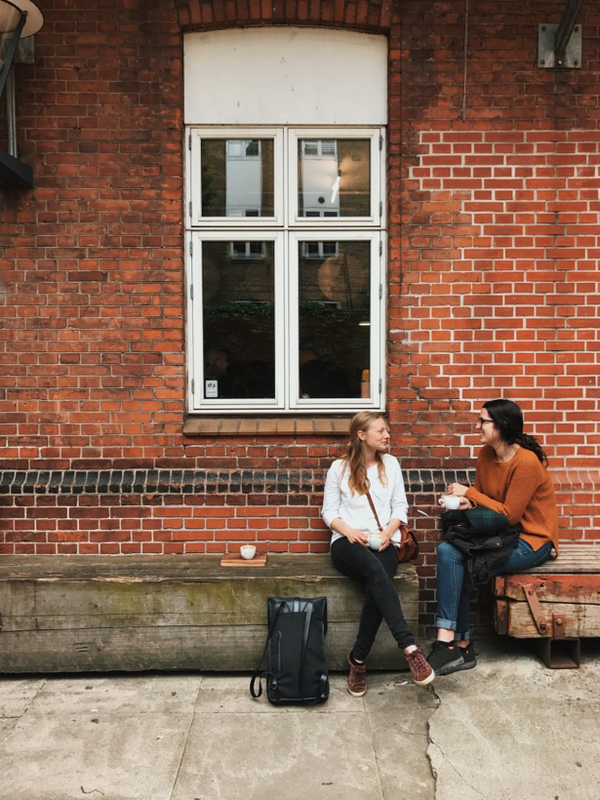 I would love you to share this with your network, email it to friends and family or just leave me a comment telling me what you think of what you’ve read. I read every single comment. A lot of the gear that I’m wearing in the blog post comes from the Norwegian outdoor company Helly Hansen. I’m really grateful that as I have a blog with a loyal following, I was able to work with them and test out some of their products. I don’t make a commission from any sales but if you want to check their stuff out, click here. Thank you for leaving me a comment! What a lovely thing that was to wake up to – you’re right, it was an absolute adventure which my cousin and I will never ever forget. I really hope you make it there one day soon! Excellent reading!! 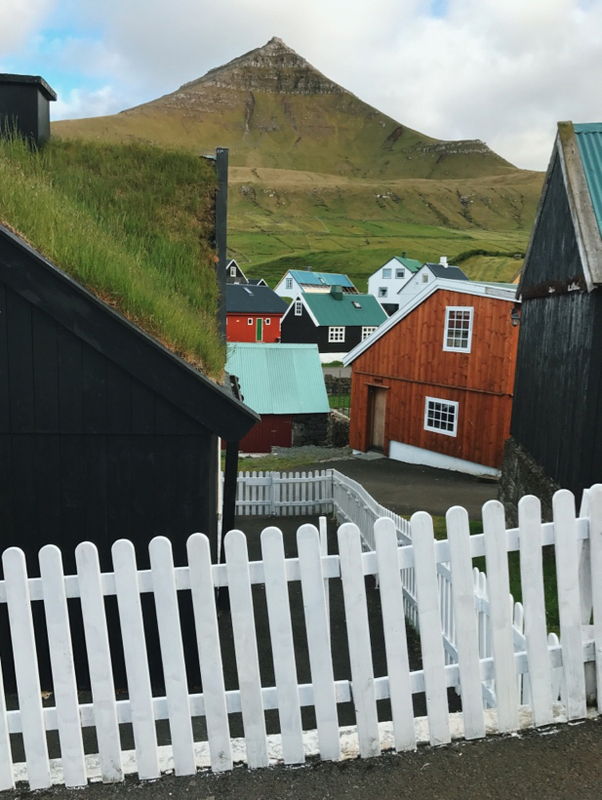 We are headed to Denmark soon; if only we had time for the Faroe Islands too! Well hello Miss Kirsty!!! Oh Denmark is super cool, you’ll love it. Any time to stop in Frankfurt and visit little old me? Oh I missss these islands!!! Great recap. 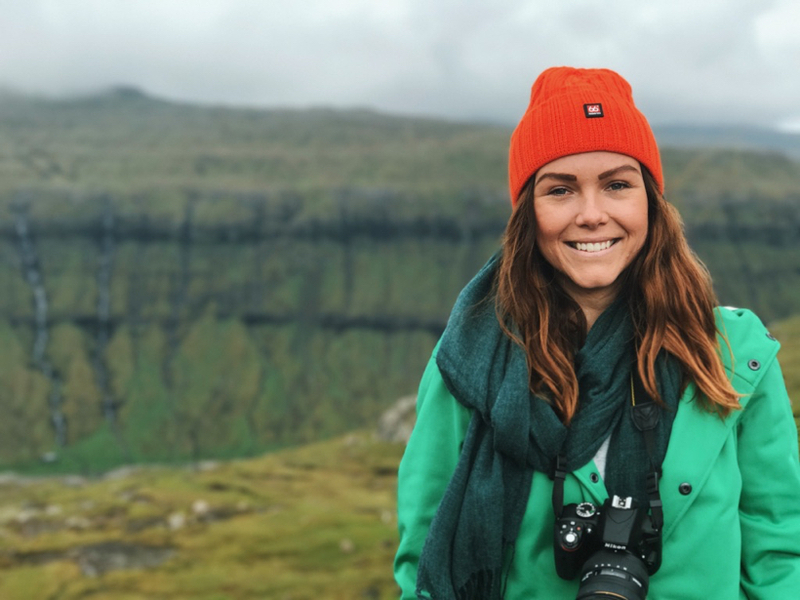 I LOVE your photos of the Faroe Islands!! And I also love food so I really enjoyed the bit about KOKS. This is definitely going on my list. Road trips are the best – especially with the right company! You go where your car and take you and your trip looked absolutely magical. Oh wow! What was it like to live in? I’ve always been tempted to move to Scandi for like a year or two. Why did you leave? That looks like one incredible road trip! I lived in Denmark for a couple of years but wish I had explored the country more. 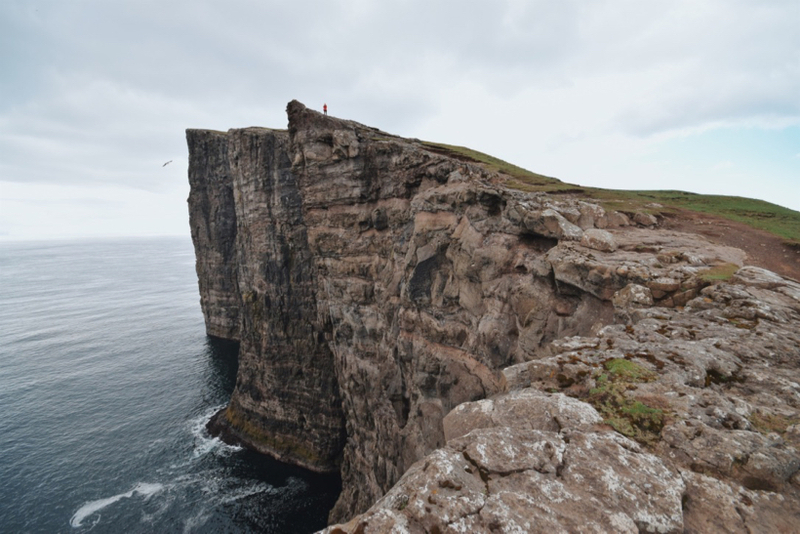 And Faroe Islands is slowly climbing up my bucket list! That car is hot!! But more importantly, this is true inspiration to finally do a European road trip. This is so beautiful and you look like you had an amazing time! I love this, because we love driving as opposed to taking planes or trains. Mainly because you can stop, see, explore and eat. You just can’t omit those places you would never have a chance to explore otherwise. Love this. Excellent write up and photoe. One point I need to correct though. You write: “This means the Danes built all of their bridges, roads and tunnels in the 60s, 70s, 80s, 90s and naughties. 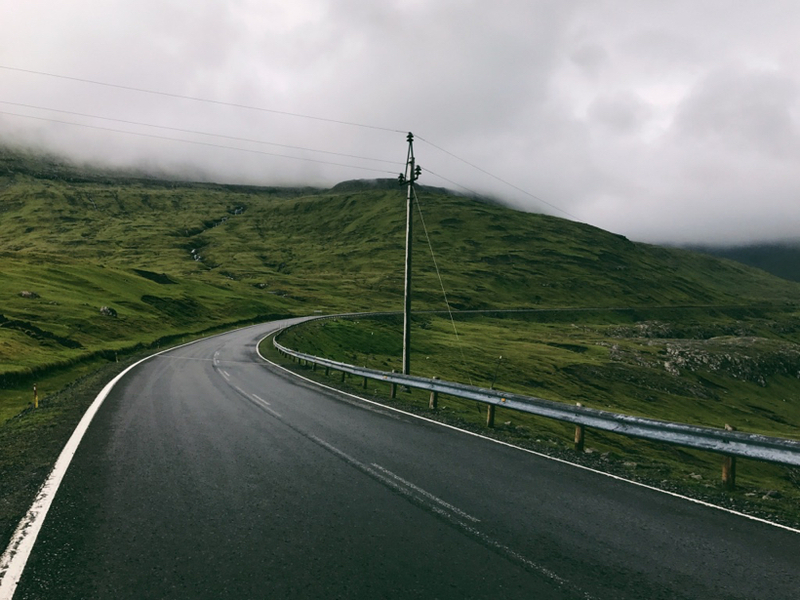 For this reason, the roads were of fantastic quality.” The roads, bridges, and tunnels were contructed by Landsverk, formerly Landsverkfrøðingurin, which is the local authority. I loved this so much! Thank you for sharing your amazing adventure! I would love to do this. Epic travel journal and journey. 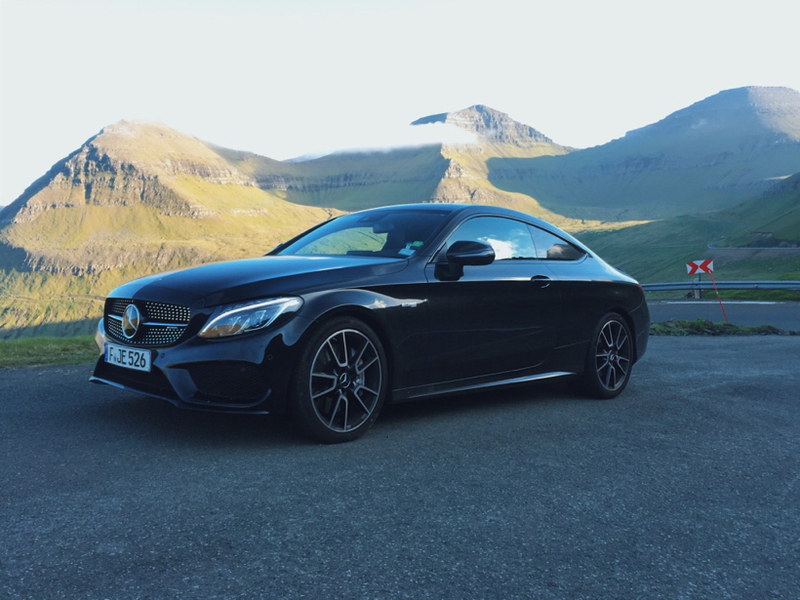 And could you have had a better car to road trip then a matte black AMG?!!!! OMG. I might be more envious of the car then the locations. It was honestly nothing short of amazing! What an adventure!! 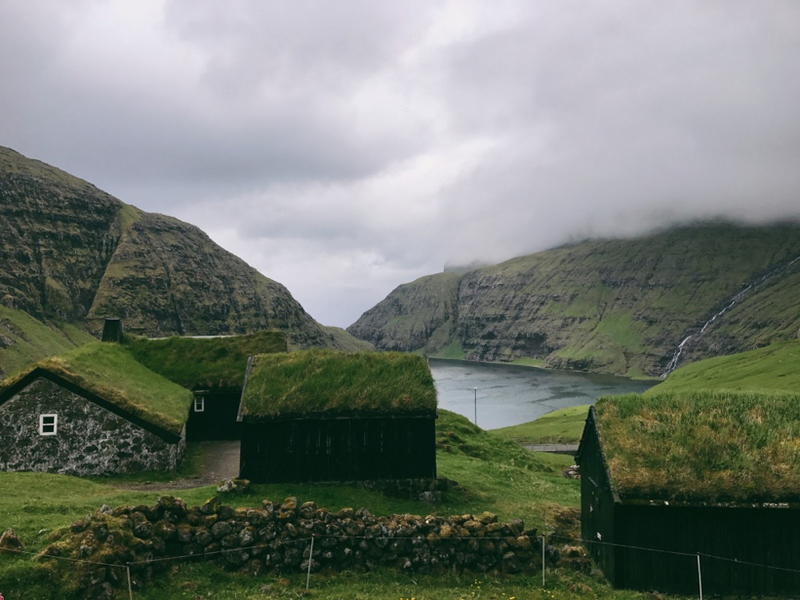 Oh my goodness that Faroe Islands look like an utter dream – what a fairy tale destination. 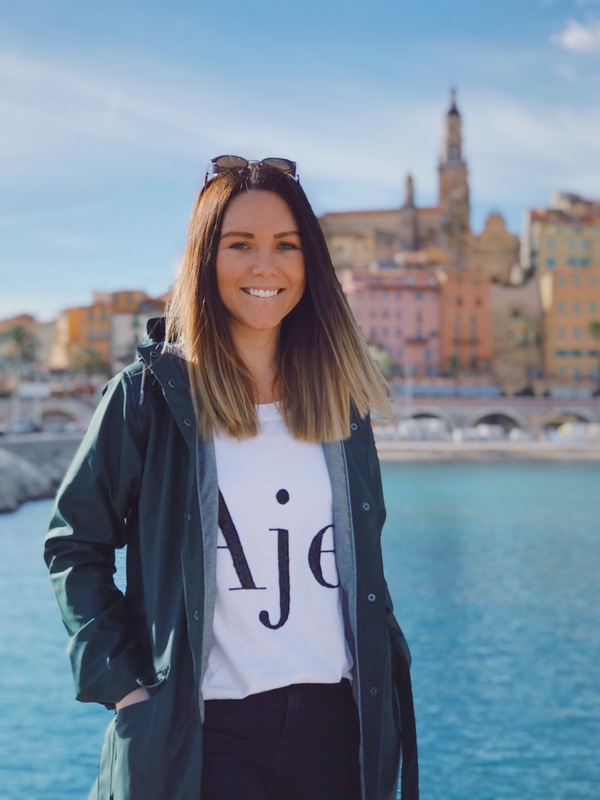 I’m an Aussie living in Sweden for a year, and this is really making me feel like I need to force myself to get up there before I head back to Australia! Absolutely stunning. Hey girl, no way ….. another Phoebe! Love it 🙂 What’s life in Sweden like? 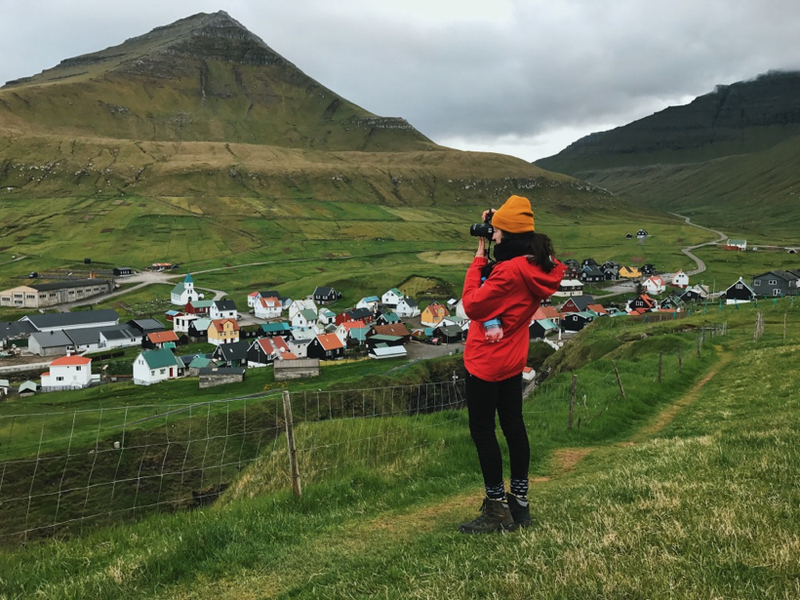 I would definitely check out Faroes and even Greenland if you can – both are incredible destinations like no other. Wow!!! Gareth!!! Talk about a way to make my day :0 That has put the biggest smile on my face. How did your partner first find my page? So great to know I’ve got some loyal readers – I certainly put so much time into this page so it’s great to know who is actually reading it. Amelia, that’s sick – you’re going to have such a good time. Are you planning on taking the Danish ferry like we did? 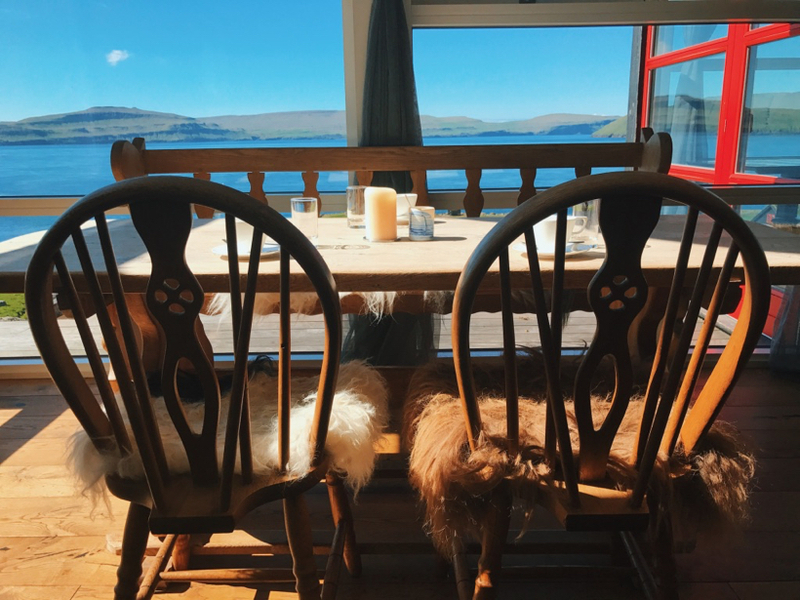 You’re going to love the Faroes – I’ve seen your photos…. it’s 100% your vibe! Hey Annie! Thanks for the message 🙂 When did you live in Denmark? What was it like? Yeah this trip was something of a lifetime, that’s for sure. I’d love to return one day. Fantastic post Phoebe. Really enjoying reading and admiring your photos. The landscape is so beautiful and picturesque. Would love to visit Scandinavia one day. Faroe Islands have been on my radar for awhile! And now I’m really wishing I could go! Love your vibrant green jacket! I’ve been to the Faroe Islands. 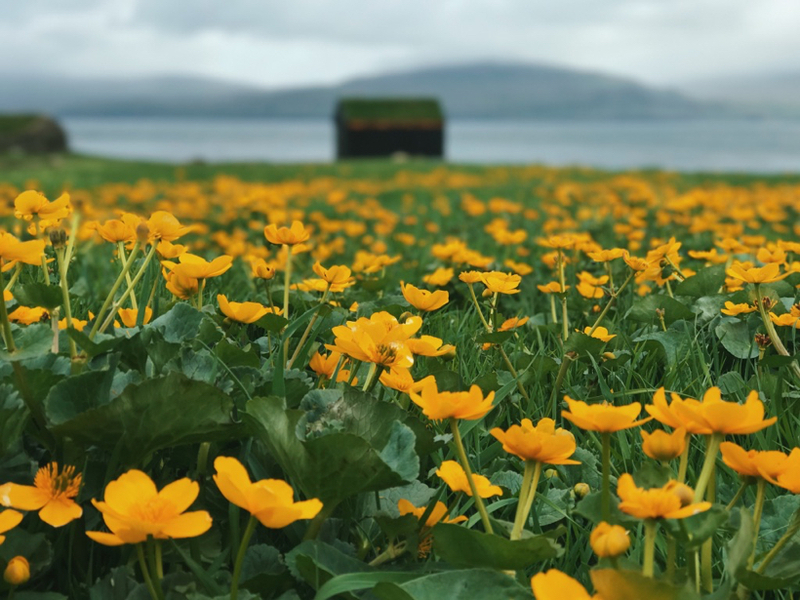 I fell in Love with the Faroe Islands Andy his post has me crunching the budget numbers and wanting to book a ticket straight back! Brings back fond memories and lots of “oh I didn’t go there!” Love your work!! I love your stories. You are really great in writing. I have never been to Scandinavian countries but I really want to visit them. Their atmosphere is so different compared to the Balkans. These countries are so clean and ordered. I have heard that locals are very nice people and always ready to help. Thank you Phoebe for this very detailed post. I have promised (and planned) to read your post for a long time (if you remember my comment on Instagram) and hey, I didn’t forget! After reading your post I feel that I know more about the islands now then just the photo impressions on Instagram – like some background information. I see the Faroe Islands to be a beautiful, fairy-tale destination, with such a beautiful, natural deep green colour. From all the green I didn’t even notice that there was indeed no single tree on the pictures! It seems like you have prepared your trip very well to get to the best spots. In particular, I liked the KOKS and the pretty (fancy) dessert Poul served. I like to see that there are so many restaurants and products everywhere in the world nowadays where people try to go “back to the roots”. I was sad to read about the development on Mykines, but nowadays everything seems to become a business. I don’t see me going to the Faroe islands within the next year, so I hope to be able to still take the (cheap) ferry once I visit. The home hospitality is such a cool thing! It’s like “food sharing” the new way. But I believe that you do have to pay for it? 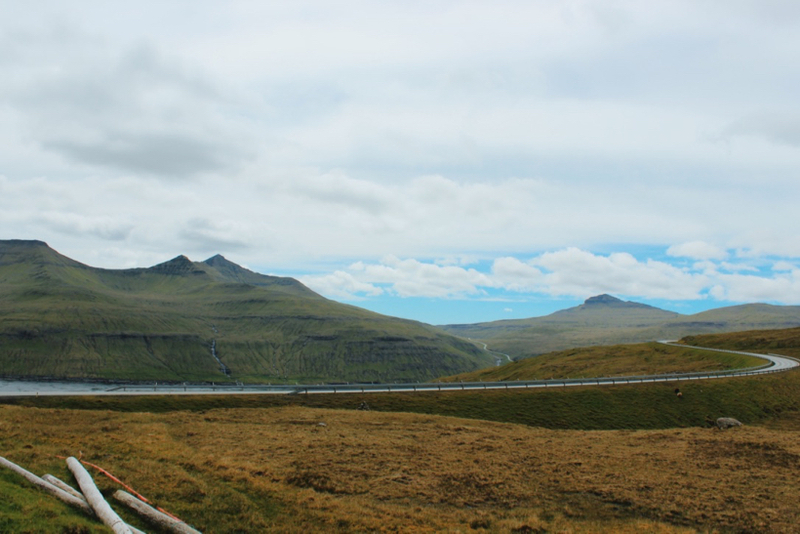 How much did you spend on the whole trip through the Faroe Islands, if it’s allowed to ask? This was officially the best comment I’ve ever received on my blog and tells me without a doubt that you read every word. For me the blood, sweat and tears of that trip & writing about the experience was all worth it – to think that my information and experience can influence others’ travel choices! It’s really beautiful this job of mine because a lot of people have reached out to me and told me they’re going to do the same trip now. Wow! To be honest, I think the biggest cost for you while in the Faroes will be food. It’s just super expensive there. A little similar to the prices in Scandinavia & Switzerland. I think between the two of us, we easily spent 100 euros a day, maybe more, on food. (We bought groceries and cooked each day because the country doesn’t really have that many restaurants.) However, we could’ve saved money by living off pasta and tomato sauce. Which we decided not to do – haha! Petrol was expensive but I filled my car up once in a week. Because of the tiny size of the place, you just won’t need more fuel! Wow, thanks for being so cooperative 🙂 I’m also not a person to live off pasta and tomato sauce. The really sad thing about going to expensive countries (Norway and Switzerland included) is that it is just impossible to enjoy the local traditional food. But 100€ per day on groceries is already reason enough to keep cooking alone. What a fantastic article, Phoebe. 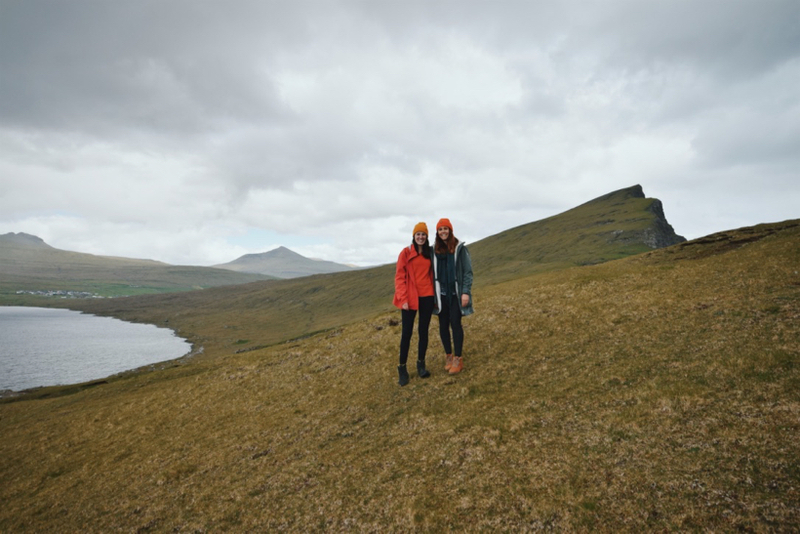 The Faroe Islands has been high on our wish list, so we appreciate all the great tips! It looks like such a beautiful place. I laughed aloud again regarding Odense pronunciation after seeing your IG story. I loved the images of your Koks meal. What a gorgeous view while you are eating. Mykines sounds like a dream come true! 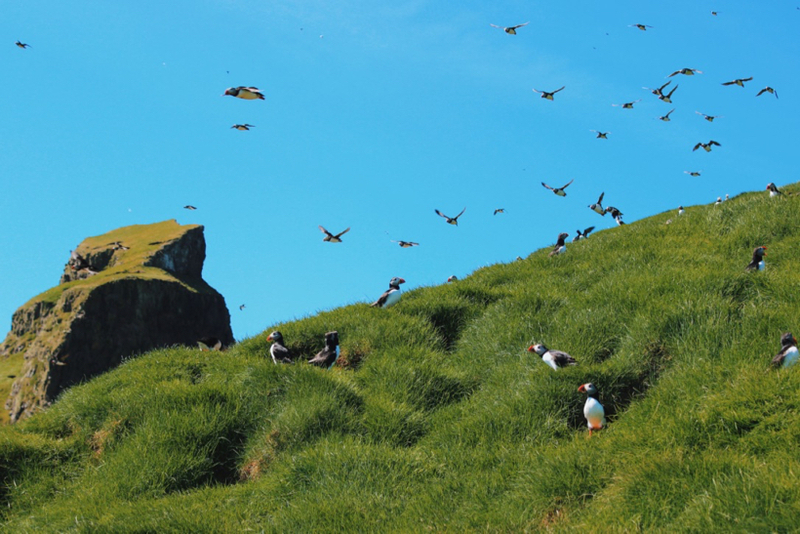 I saw my first two puffins in Iceland this past summer and am in love with them. They crack me up with their funny facial expressions and movements. That’s amazing that you saw so many. Super helpful to have the heads up on how they might be limiting access to the island in the future. I also loved the grass covered roofs and red windows and doors – such a photogenic place. Your article has made us even more excited for a future visit! Wow! Nice tour! Now, I want to visit Faroe Islands with my GF. Hey Jack! These photos and this blog are 1.5 years old – if you head to my Insta @kaptain.kenny you’ll see my most recent photos from the trip there last week!